Tracking the number of annual visitors to Canada is a big deal to the employees at Destination Canada. The data helps them understand the outcome of their hard work, and where to devote future marketing campaigns. As Canada’s national tourism marketing organization, Destination Canada is responsible for marketing Canada as a premier four-season tourism destination where visitors can enjoy extraordinary experiences. Its 100 plus employees rely on accurate, up-to-the-minute market intelligence to stay competitive within the global tourism industry. When Natasha Langlois, Strategic Advisor for Corporate and Employee Communications, attempted to share the most recent visitation numbers with her colleagues, she didn’t exactly generate the enthusiasm she was expecting. Their intranet—a vital communication platform—was under-used, outdated, and unable to fully connect to their distributed workforce. They quickly realized it was time for a new intranet platform. Destination Canada wanted an intranet solution that connected all employees to important company news and content. The company also desired a platform that provided more autonomy for employees, so they felt empowered to share information and celebrate their own success. Ultimately, they wanted a new intranet to be a destination where employees to go. But how would they accomplish that? Like most organizations that deploy an intranet, it was important for Destination Canada to set goals. One of the best ways to ensure intranet success is by setting clear expectations of what your intranet will help you accomplish. Setting intranet goals and aligning them with organizational objectives helps ensure that your intranet has a clear purpose. With a mandate to support the Canadian tourism industry and help them reach international markets, Destination Canada wanted one central place for everyone to come together to access news and corporate updates. The company also wanted to curb the corporation’s over-reliance on email to boost productivity. Managing email can be frustrating for employees—especially when they are included in unnecessary threads of communication or have to spend hours sifting through their inbox to find important information. It was additionally important that the intranet helped increase employee autonomy. As an organization that seeks to empower its employees, Destination Canada wanted a solution that showcased employees as subject matter experts and allowed them to publish their own content. To ensure they got the most out of their intranet, Natasha attended many of the training opportunities and services offered by ThoughtFarmer. “Attending these training sessions really reinforced the ‘why’, as in why we got a new intranet and drove home how to measure our success based on the goals we set out to achieve,” said Natasha. 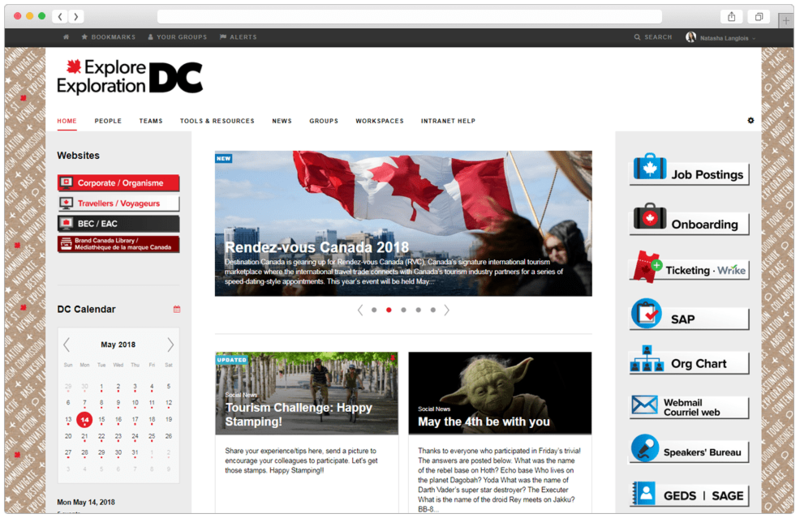 It didn’t take long for Destination Canada to begin measuring the success of their intranet. After attending a measurement and analytics workshop by ThoughtFarmer, Natasha quickly learned what to measure, why it’s worth measuring, and how to measure it. She now closely monitors things like the number of comments on a story, the most visited pages, the top videos played, the number of downloads, and the amount of likes and follows. These metrics provide crucial insight into things like adoption, reach, overall usage, most active users, and even potential cost savings. Defining the right intranet metrics makes it easy to determine and measure success. It also makes it so much easier to calculate a return on investment (ROI). As part of their collaborative culture, Destination Canada hosts ‘quick fire’ meetings, where employees will often discuss current challenges they are facing. Natasha is quick to encourage them to post their problem on the intranet, so other employees can comment and join the discussion. Having a platform to share ideas and challenges is an excellent way to gain access to internal knowledge share and communities of practice within an organization. One of Destination Canada’s key roles is supporting the Canadian tourism industry with consumer and market intelligence. ThoughtFarmer helps Destination Canada ensure this information is easily accessible for all employees to view and share. With a brand new intranet, Natasha was determined to generate excitement around the annual tourism numbers. After collecting information from the Canada Border Service Agency, she posted a contest on their intranet where she invited employees to guess how many tourists had entered Canada in the last year. With much excitement and interest generated, the post generating the most engagement than any other and Natasha had succeeded in creating an intranet that employees wanted to visit. Oh, and if you are wondering what the final annual tourism number is, the answer is 20.8 million trips of one or more nights—a new record! Natasha and her team are continuously setting new goals, and aspiring to do even more with their intranet. When ThoughtFarmer launched their annual Best Intranet Awards competition last spring, Natasha was amazed at what other organizations were able to accomplish with their intranet. “Seeing all the Best Intranet Award submissions inspired us to do more and push the boundaries of what an intranet can do”. Based on the appearance of their intranet, Destination Canada seems to have figured out exactly how to make their intranet visually appealing. Benefits of a well-designed intranet go far beyond aesthetics. Sharply designed intranets are easier for users to browse and navigate, allowing end users to quickly find desired information and people. Natasha also created an internal intranet council, where members and contributors continually meet to discuss intranet specific topics like what’s new, and what is upcoming. Staying connected to end-users is one of the best ways to improve and maintain adoption and improve the overall intranet experience. For now, Natasha remains the key point person for their intranet, but that will likely change soon. “The goal is to eventually have each business unit oversee their own section and for more of our staff to feel comfortable and confident in posting their own content,” said Natasha. Designating ownership per department reduces the overall workload on intranet managers while providing business units increased empowerment and visibility into what others are working on. Employees now have centralized and online access to the intelligence, insights, and autonomy to collaborate and more effectively do their jobs. Like the amazing country they promote, Destination Canada’s intranet has evolved into a wonderful place to visit.